You can personalize the application by uploading your Company logo and details to your vtiger CRM service; as a result, company logo appears on your home page.Also, your company logo and address can be used in email templates and Inventory tools such as Quotes and Invoice, when exported to PDF files. 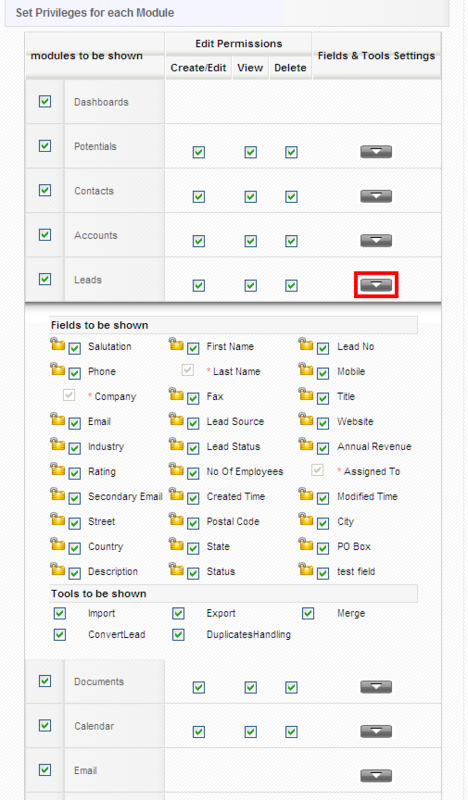 Go to vtiger CRM Settings Icon > On-Demand Admin > Company.Fill up the fields in Company Details block and click Save. Go to Branding > Change logo, click Choose File to browse for your company logo and click Upload to save changes. To enter your company data in vtiger CRM open source, go to Settings > Company Details (This can be found under Communication Templates block). 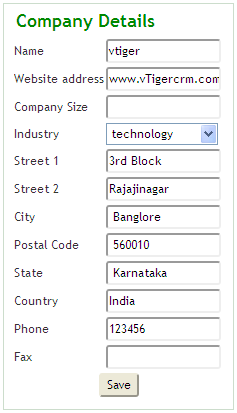 Fill up the fields in Company Details block, browse for your company logo and click Save to save your details. Make sure that you upload .jpg or .JPEG images as your company logo.If you use GIF or PNG format, just change the extension to JPEG because it is required for its use in PDF files. vtiger CRM includes a flexible framework with over 20 modules covering Sales, Support, Marketing, Inventory, Projects, Calendar and more. 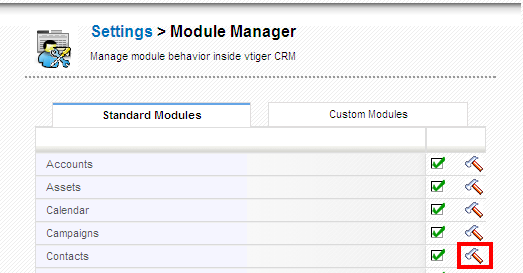 Using the Module Manager, you can enable, disable and configure the settings for each module.You can also import new modules from the Module Manager. 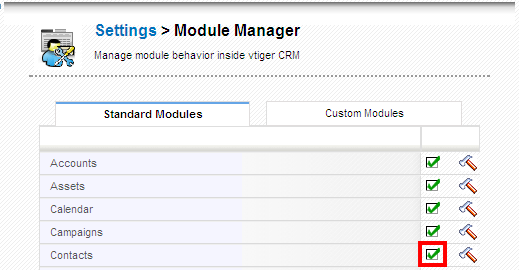 Steps to configure modules in vtiger CRM: Go to vtiger CRM Settings Icon > CRM Settings > Module Manager. Click on green tick mark icon, highlighted below, to disable the module(s) that you would not plan to use. Click on red cross mark icon, highlighted below, to enable the module. 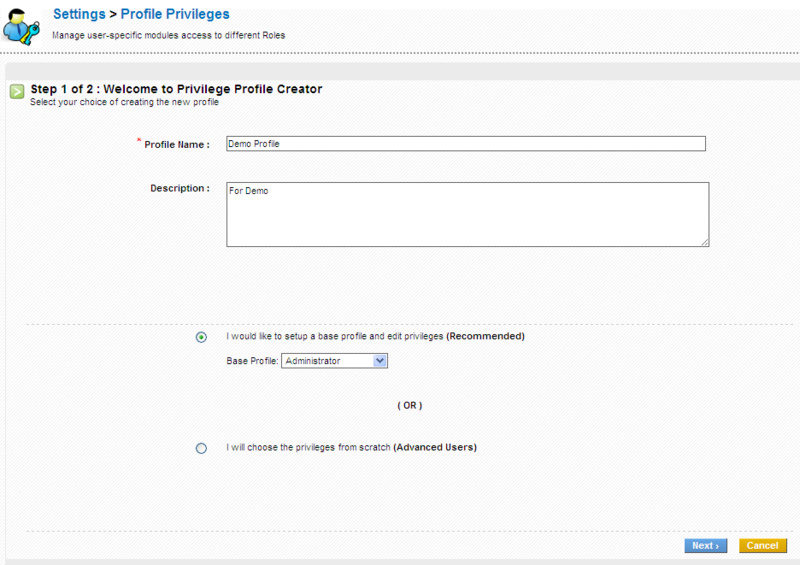 If you want to limit certain modules to only some users, you can use Profiles in the Users Management section. 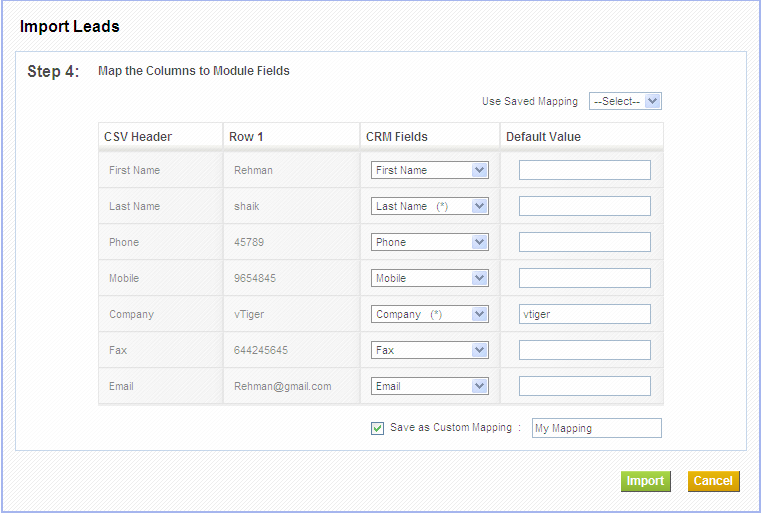 vtiger CRM offers a set of default fields.You can add new custom fields, re-arrange fields, edit field properties, and move fields inside and across blocks. Go to Settings > Module Manager. Click on module settings icon, highlighted below, at extreme right of each module. You can re-arrange fields within a block using the arrows provided for each field as shown below. You can change some of the properties of a field by clicking on the edit icon provided for each field. Mandatory field This field will be made mandatory for the Users to fill in. Active If enabled, displays the field or else hides the field. Quick Create The field is available in the quick create of the module. Mass Edit If enabled, the field is available for mass edit. Default Value Used to set a default value in a field. Some Checkboxes are disabled in some fields, because their properties cannot be edited (which otherwise can lead to inconsistency in the CRM). You can add custom fields to any block by clicking on the icon highlighted below. You can move fields from one block to another.When you click move-field Icon, highlighted below, a popup will appear which will show the list of fields from other blocks.You can select field(s) and click Apply to save changes. Blocks contain set of custom Fields.You can hide the unwanted blocks.Also, you can create a new custom block and place it at any desired location among blocks. 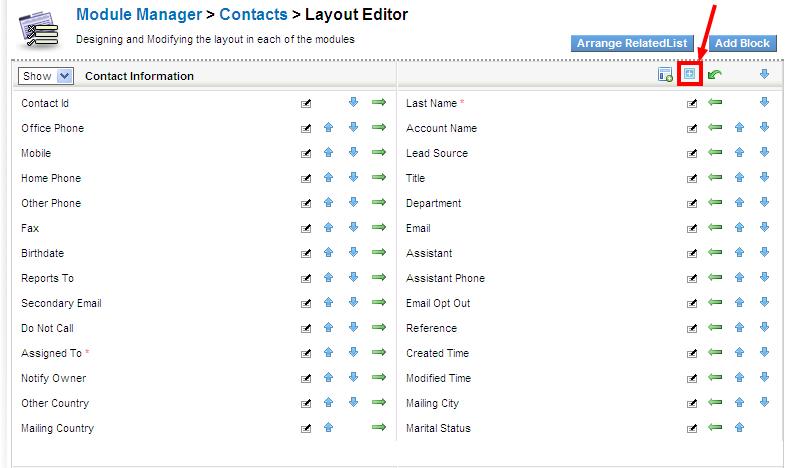 For instance, create new block 'More info', next to Contact information block. 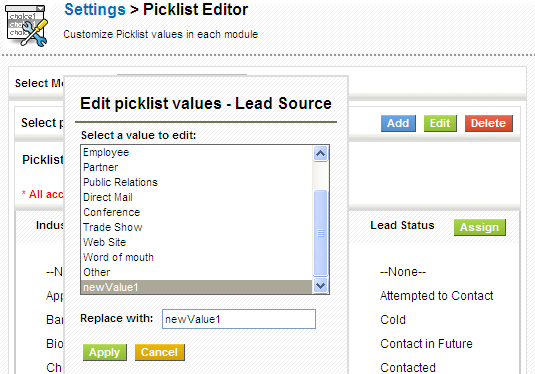 As the name itself says, picklist is a dropdown field with list of options available, within which, only one option can be selected.For instance, Lead status in Leads module.Picklist Editor can be used to customize the picklist values in different modules.Select a role before performing global actions such as add, edit and, delete; as the picklist values vary across roles. 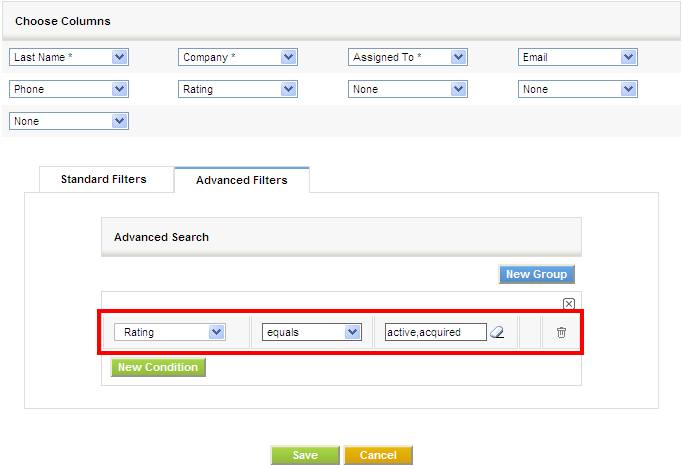 To customize picklist, select desired module from Select Module dropdown (ex:Leads); consequently, Select picklist dropdown displays respective picklist fields (Industry, Lead Source, Lead Status, Rating, Salutation) available for that module.This dropdown can be used to select the picklist field for performing global actions. Click on the Add button next to the Select picklist dropdown. This will bring up a popup with the existing picklist values displayed on the left-hand side. 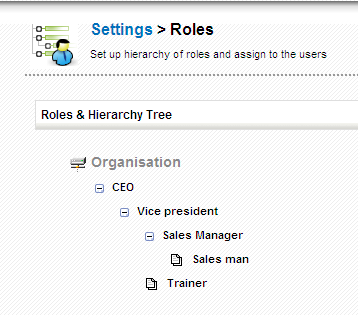 You can add new values in textarea on top-right and assign role(s) on right hand lower side of the popup accordingly. If you don't select any role for the new picklist values, they will be present in the picklist values but not displayed for any role (other than admin). Click on the Edit button next to the Select picklist dropdown. This will bring up a popup with the existing picklist values in select box. select a picklist value you intend to edit. you can edit the picklist value in the textbox below the existing picklist values. Once you are done with the changes, click on the Apply button to save your changes to the picklist. Click on the Delete button next to the Select picklist dropdown. This will bring up a popup with existing picklist values. Delete one or multiple values and select a value from Replace with dropdown, to replace all the values with that name. 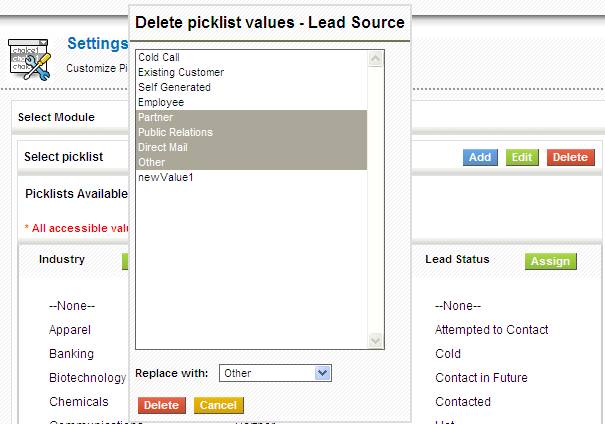 For example, delete picklist values(Partner,Public Relations,Direct Mail,other) and replace with 'Other'. Deleted picklist values will be replaced with another value.The information stored in deleted values will be moved to newly defined value. You should have atleast one value in picklist. 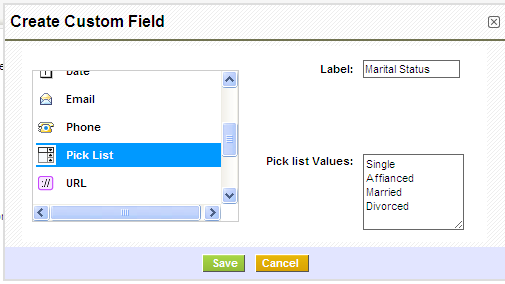 vtiger CRM also allows users to create new custom picklist fields using Custom Fields. 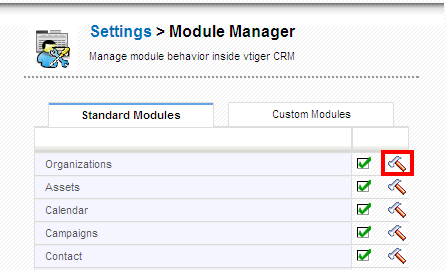 2.Click on module settings icon, highlighted below, at extreme right of each module. 4.Click on add custom field icon, highlighted below. 5.Select field type as Pick List on left hand side, provide a picklist name in Label on top-right, and provide values in Pick list Values textarea on righthand lower side of the popup. Who can view certain record? Who can edit certain record? Who can delete certain record? Who can create certain record? 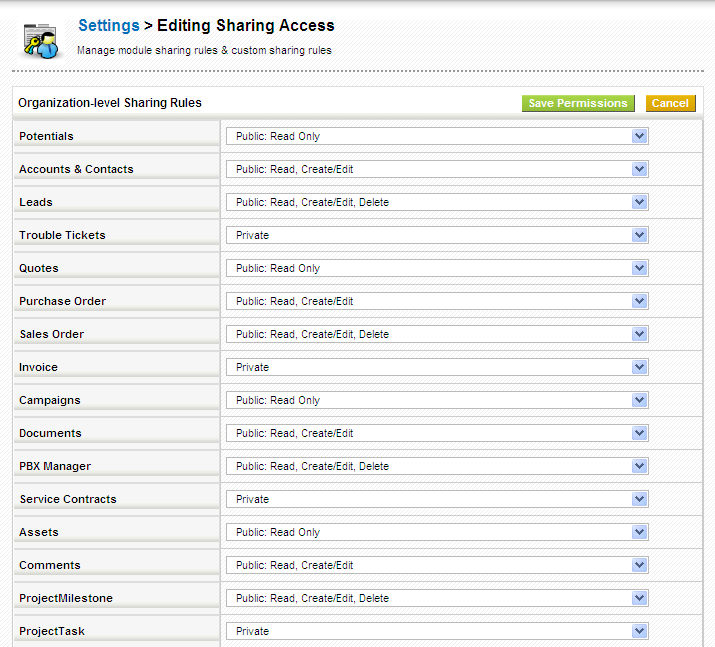 You can configure module specific sharing rules with Sharing Access.You can be able to hide or restrict user's access on records with-in a module.Sharing can be set to public (all users view all the records in the module), or private (only users with higher role than the record owner will be able to view the record). Other users can read, but cannot edit and delete records. Go to Settings > Sharing Access > Change Privileges. Select desired setting for each module. Click Save Permissions and then click Recalculate. Administrators can also set Custom Sharing Rules from the Sharing Access page, if the module specific rules and options do not cover their needs.By using Custom Sharing Rules, admin user can make certain modules of higher hierarchy accessible to role at lower hierarchy. 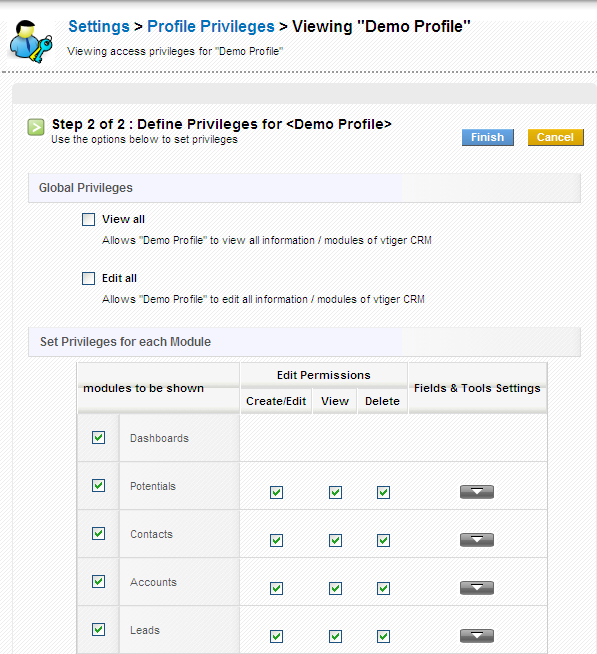 Profiles can be used to regulate user's access on modules, fields, and records within them.With profiles you can set the user privileges to delete, create/edit or view data.Like Sharing Access, profiles also play vital role in ensuring security by limiting the activities on records.Please note that the settings of the global privileges are always superior to the other privilege settings.Roles are based on profiles.vtiger CRM comes with a set of pre-defined profiles(ex: 'Administrator') which you can use and change but not delete. Click the name of a profile to see the details. You may change the profile by clicking the Edit button. To create a new profile click the New Profile button at the list view. You can edit fields in a module by clicking on icon highlighted below. Click Finish to save your settings. When sharing access for a module is set to private, a user's role in the role hierarchy determines what records he/she can access. A user can only view own records (i.e., records assigned to that user), and records assigned to users with a lower role.Role holds a position in a company (ex:sales manager) and can be assigned to multiple users of same functionality.A role can also be assigned to multiple profiles.This can come handy if same person holds two different positions.For instance, 'Rahul' is a Sales manager, but he also participates in support operations; therefore, you could create a role called 'sales and support manager' and assign both support and sales profiles to him.Each role also specifies who they report to, creating a hierarchy. By moving your computer mouse pointer over a role entry, you can be able to see set of icons by which you can perform operations such as add, edit, move and, delete roles.The "+" function creates a new role which is located in the hierarchical order one level below an existing role.The image below displays a sample for an edit view of an existing or new role.You have to give an unique name and assign desirable profile(s) to the role. vtiger CRM features two types of users: Administrator, has access to register new users, assign applications, lock users etc; and User, has limited access and can only use applications assigned by admin.When adding a user you should select the role.Privileges of a user depends upon the role you would assign.You can also set admin privileges; it then,gives access to Settings page.User privileges are not shown.User information cannot be visible to other users.Access privileges of a user also depends upon settings enabled in Sharing Access. 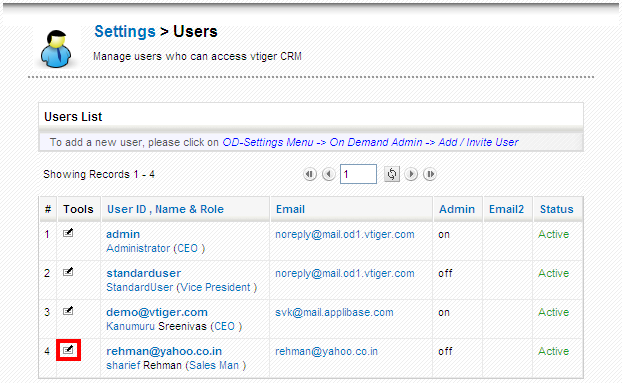 To add new users in vtiger CRM, Go to OD Settings > OD Admin > Add User. 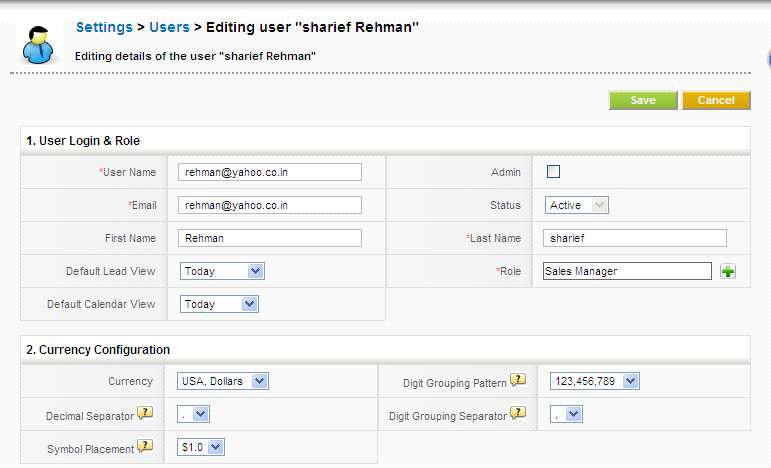 Fill up the fields in Add User block, and click Create account to update your details. 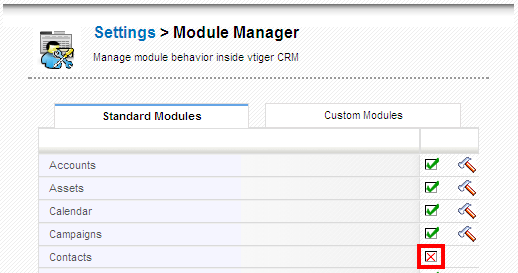 To activate vtiger CRM service, click on X mark icon, highlighted below, under vtiger service and click assign. Click on edit icon, highlighted below, to edit user information. 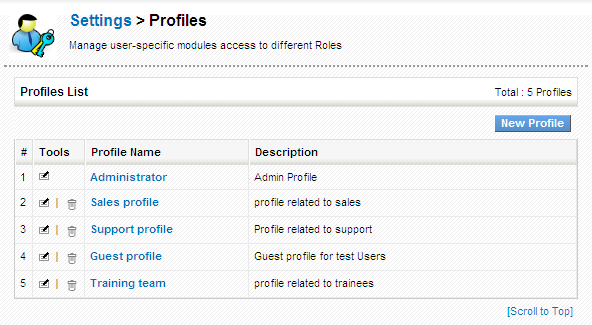 Update user information, assign a role and click on Save, to save your details. To create a new user in vtiger CRM open source, go to Settings > Users > New User. 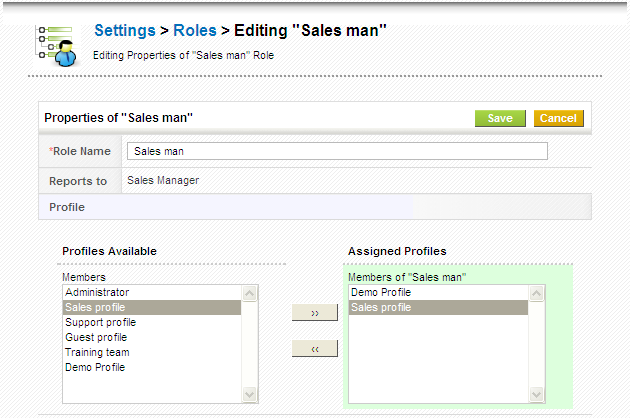 Fill up the fields, assign a role and click Save to update your changes. vtiger CRM offers a supportive tool to import customer data such as Leads, Contacts, Accounts, Potentials, Services, Trouble Tickets, Service Contracts, Products, and Vendors from CSV files. Click on import icon, highlighted below, to start importing customer data. Enable Save as Custom Mapping and provide a name if you'll be using identical mapping many times in future;It then, appears in Use Saved Mapping picklist.You can provide a default value in theDefault Value textbox available for each field.Click on Import to import the data. 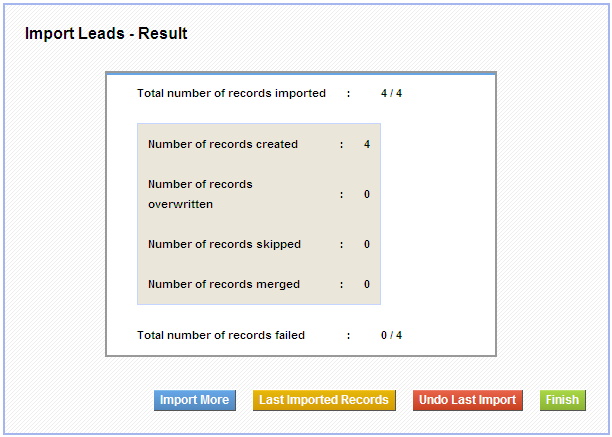 History of number of records imported, created, overwritten, skipped, merged and, failed will be displayed after successful mapping. vtiger CRM provides an effective search tool that can rapidly filter records in a module.You can be able to limit your search to selected columns and search criteria. 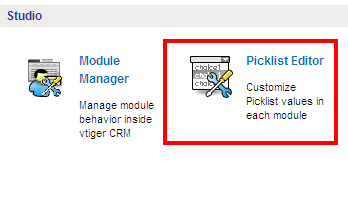 Select a module and click Create Filter link(highlighted below) in the listview of a module. Provide a name to your filter in View Name and select the columns that has to be displayed in list view, when filter is selected. 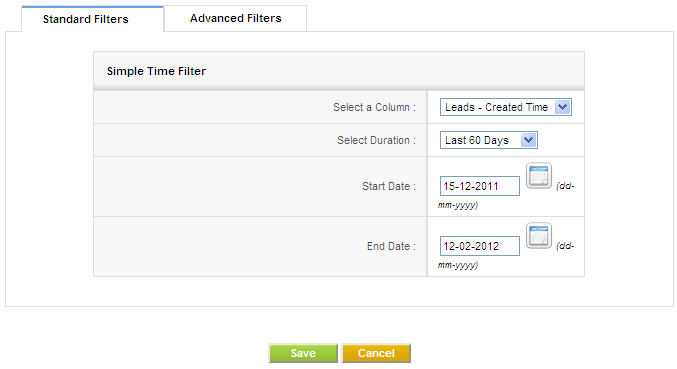 On save you will be able to see filter in action.At this level you can see the list of records in selected columns. Both Standard Filters and Advanced Filters are used to enhance and refine your filter. Standard Filters refine the search depending upon date intervals or particular period. This picklist allows users to refine search depending upon record Modified Time or Created Time. This picklist allows users to select time duration in accordance with Select a Column option above. 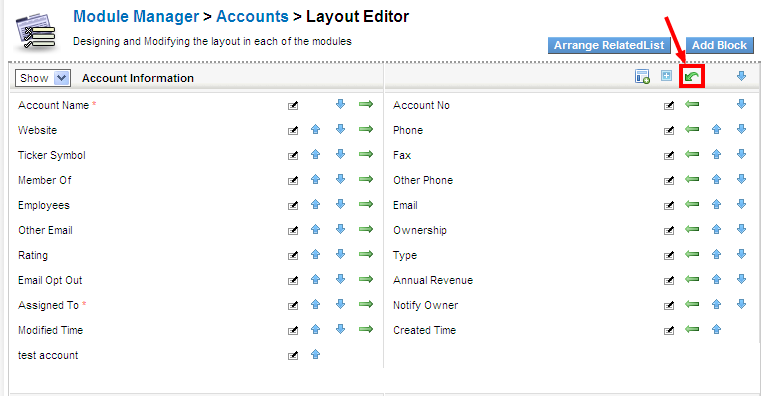 You can fill these fields manually or if you will select the duration, these fields will be automatically filled. Advanced Filters refine the search depending upon lead information. This block contains three columns.Select desired field name from picklist in first column, set desired relation from picklist in second column and enter one or multiple items in third column manually.Items you enter in third column should be separated with commas. On Save, listview of items filtered based upon search criteria in Advanced Filters. 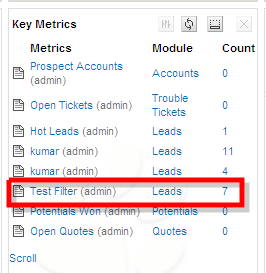 This option if enabled, the count and details of the filter will be shown in the Key Metrics widget on the Home Page. If this option is enabled, the view will be made default for the users. If this option is enabled, every user of CRM, irrespective of role/position can view it.When a user marks a custom filter as public, it should be first approved by admin.It remains in pending state until admin approves it.Admin can see the request under the Pending section.